Hotel Iquique (3 nights, double room, 67PEN/$24) was friendly enough, but the room seemed slightly damp and the bed was quite uncomfortable. However, we soon realised that pillows which could double as a writing desk seemed to be the norm throughout Peru. The hot showers were touch and go too. A nice bonus was the covered rooftop terrace which gave us “a view” of the city. After a good nights sleep we headed out on a preplanned walking tour of downtown Lima. 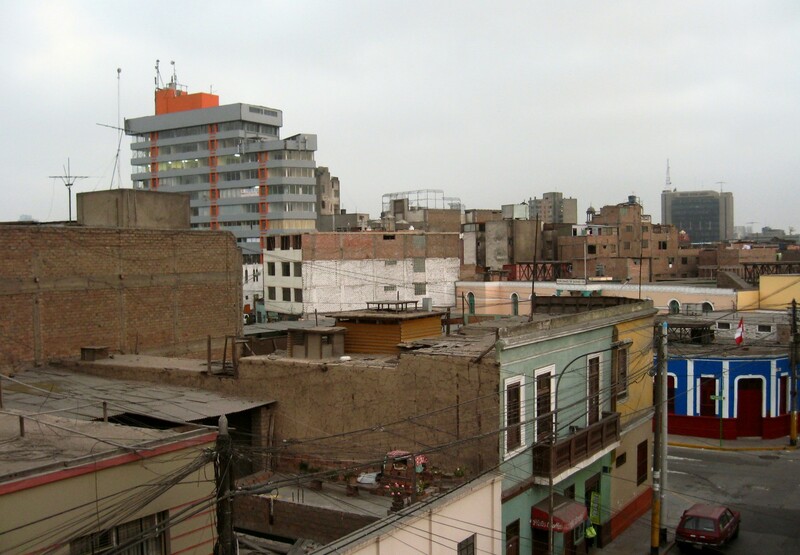 Lima is a dirty, grimy town. The traffic seems out of control while little combis or micros packed with people zip around and crash into each other. There is incessant honking and no end of dirty food stalls at the side of visibly polluted main roads. We decided to cross the highway and then the Rio Rimac (via a crumbling bridge) into the Rimac area of Lima. This is where the slums are located and tourists rarely go. It didn’t feel overly dangerous. A taxi driver offered to take us up to the slums and give us a tour. We politely declined. 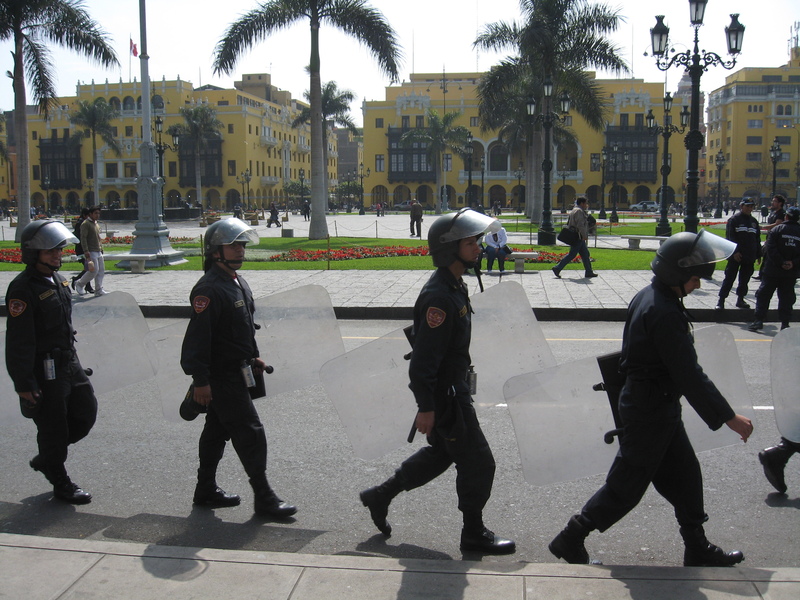 When we reached the main square (Plaza de Armas) it was heavily policed and in the process of being cordoned off. According to one local, the President was making a speech that afternoon and the police were expecting many protesters. Luckily for us it was a peaceful protest, and we got to enjoy a relatively empty and traffic free view of Plaza de Armas! Lima is not a very walkable city. Taxis and micros are the easiest and cheapest method of transport. While at first micros seem impossible to understand, it just takes one ride to become an expert. Micros tend to run a pretty direct route up and down the same street, and major street destinations are marked on the side of the van. Micro and combi drivers are extremely aggressive and were clearly racing each other to pick up passengers. The men/women that take the fare yell out destinations in incomprehensible Spanish. For those with no Spanish the best thing to do is yell your destination back at them and they will tell you whether to get in or not. A combi/micro from downtown Lima to Miraflores will cost you 1.20PEN or about 45 cents. 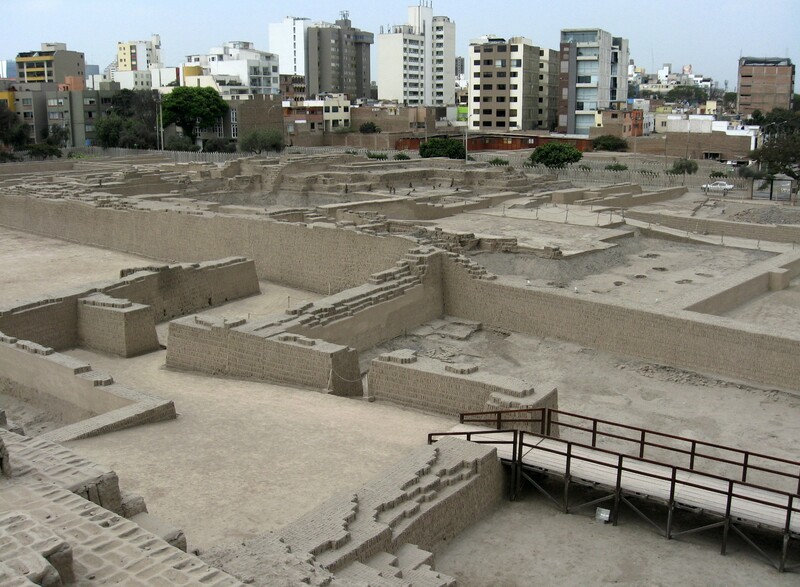 View from the top of Huaca Pucllana, Lima. We took a taxi for 12PEN (about CAD$4) to Huaca Pucllana (adults 10PEN/ $3.50), a Quechuan adobe pyramid, which was a nice introduction to Peruvian history. We had a very knowledgeable English speaking guide. 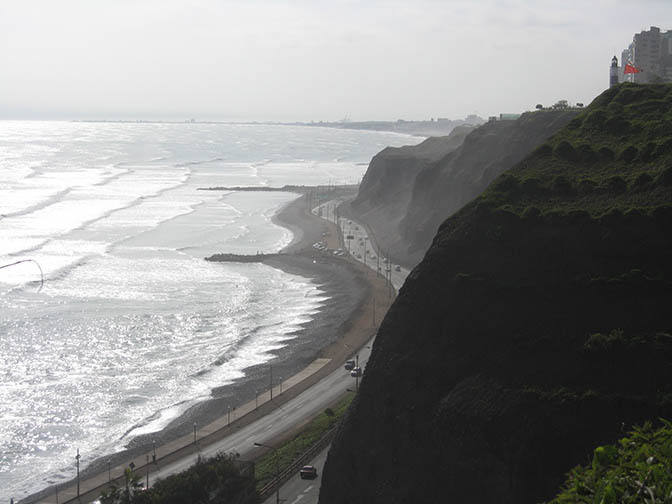 We then walked to Miraflores to get our first glimpse of the Pacific ocean; we weren’t disappointed. Parque del Amor is a must see. 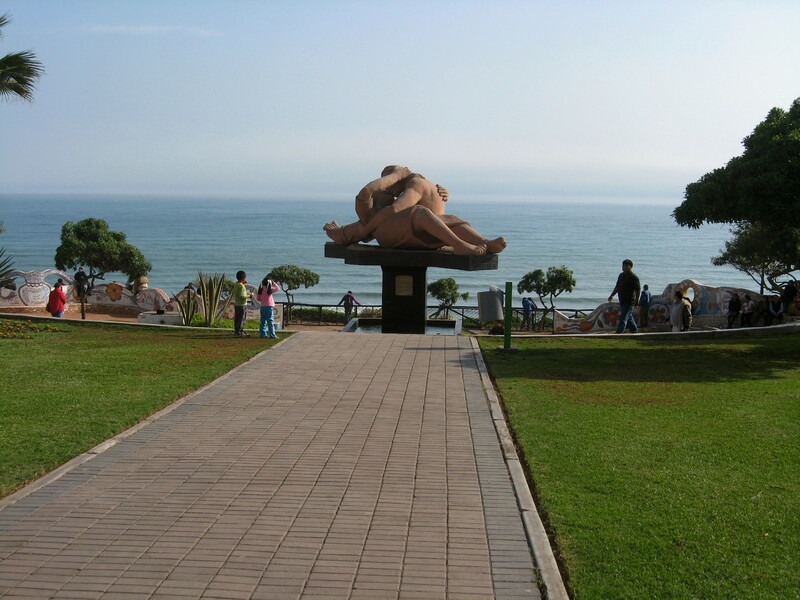 Not only does it have an amazing view of the beach, but a grotesquely beautiful sculpture to boot. Miraflores is nothing like the rest of Lima. It is clean, tourist friendly, and easy to walk. It seems to have a dream-like quality about it; or is that just the smog? 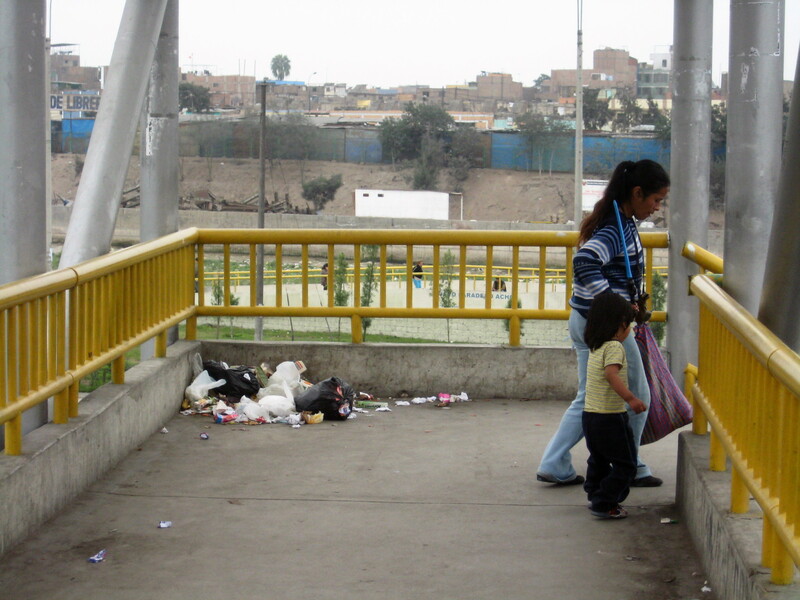 Lima doesn’t have a central bus station (as is common procedure in most Peruvian cities). Our next stop is Pisco. PeruBus services Pisco (30PEN/$11) from the terminal on Avenida Mexico. 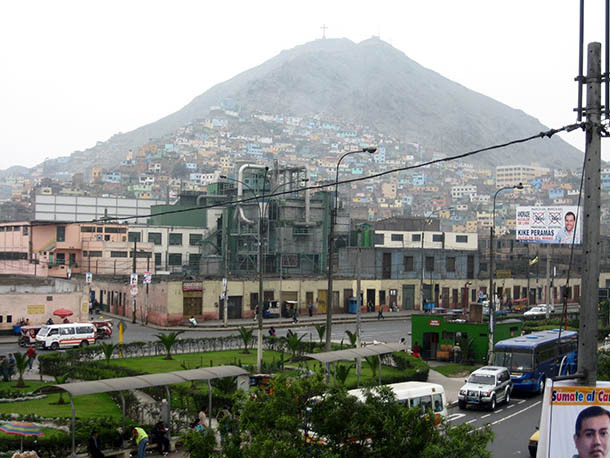 Three nights in Lima grand total (this includes accommodation, transportation, food, etc. ): 169PEN/CA$61. We manage to complete the first leg of our journey $4 under budget! Awesome post! 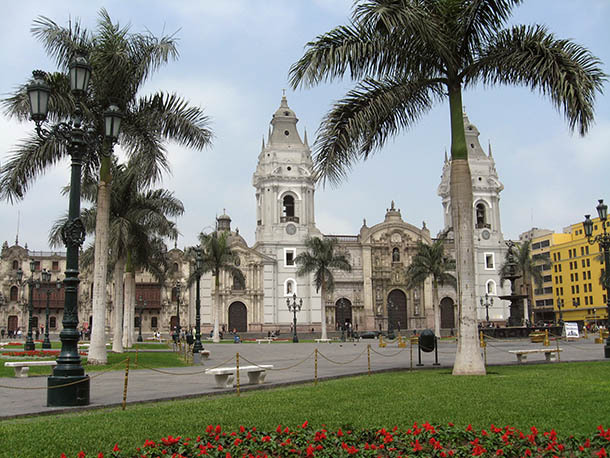 Peru and Lima in particular, are very unique places to visit and I am glad your adventure was fulfilling in many ways. I liked to described Lima as “organized chaos with a bit of social anarchy thrown in” and the account of your travels around the city reminds me of that. I can believe you spent so little money, less than I when I go visit (and I lived there! and speak Spanish! and don’t look like tourist at all!). Good luck in your future adventures and thanks for pointing my article about micros (transportation) in Lima. Thanks! I’m glad you enjoyed it. It’s good to know that I managed to capture a little of how Lima “feels”. It was our first stop in South America, so we were definitely feeling the chaos! I actually never meandered outside of Miraflores, so my view of Lima isn’t actually the dirty and grimy one that many people have! A tour of the slums may actually be pretty interesting, though I would’ve hesitated as well. I also briefly saw them while I was flying in, the vastness of them is astounding.